Ramit Plushnick-Masti woke just after 4:30 a.m. Sunday to find water seeping into the bathroom. She ran to the sunroom that faces her backyard and discovered water already 5 inches deep. Out front, a brown river sloshed from the street to her doorstep. She roused her three young sons and began frantically moving rugs, photo albums and electronics to dry surfaces. At 7:30 a.m., she called 911. But hours later, no one came. "They were backed up pretty badly," Plushnick-Masti, 42, a communications director at the Houston Forensic Science Center, told HuffPost by phone later that evening. "But by about 10, it was clear that it was going to be catastrophic." She began posting on Facebook and texting friends, and found out her local rabbi was sending a boat around to pick up stranded people in need of rescue. The family of five threw laptops, cellphones, chargers, a few pairs of pants and some T-shirts into garbage bags and waited, perched on the kitchen counter, water lapping just inches below. When the motorboat arrived to pick them up, the water was so high it overturned the family's washing machine and stand-up freezer. Plushnick-Masti, who is about 5 feet tall, had to swim to reach rescuers. "It was cold, it was nasty, it was brown," Plushnick-Masti said from a makeshift shelter a church, where the electricity was out. "The water was so powerful." Hurricane Harvey, the strongest storm to make landfall in the United States in nearly a decade, brought on Plushnick-Masti's fourth flood since moving to Houston in 2010 ― and the second one that's caused damage to her home. But it's the first time she's been forced to flee by boat. She lives in Meyerland, southwest of the city's center. The neighborhood is predominantly middle class, and roughly two-thirds of the population is white, according to census data. People walk down a flooded Houston street as they evacuate their homes Sunday after Hurricane Harvey hit. Meyerland has experienced flooding in the past few years, but it usually is spared the worst of the damage. Heavy rains often wreak havoc on neighborhoods on Houston's east side, though, where many low-income African-Americans and Latinos live. The city has made upgrades to Meyerland's flood infrastructure in recent years, Plushnick-Masti said. She had flood insurance as part of her mortgage. "It's different when this happens in areas with some money and influence," she said. "You are seeing some improvement to bayou and flood plains, but they can't keep up with these storms." Houston's growth in recent decades has made it the country's fourth-largest city, but its urban planning regulations are still rooted in the Wild West days. The city expanded outward, turning lands that once absorbed rainwater into parking lots, roads and developments. There are no environmental zoning laws, only deeds that allow property owners to dictate how the land is used. In wealthier ― which, in a city where Jim Crow once reigned, usually translates to whiter ― areas, residents invited flood safeguards, such as dikes and berms, and spurned hazards such as chemical plants and refineries. "No one has ever really seemed to care very much because those people don't have much political clout or voice," Paul Hart, a historian at Texas State University who grew up in Houston, told HuffPost. "Over the last 15 years or so, as the city has exploded in growth and they paved the wetlands, those middle-class white and upper middle-class areas, like Meyerland and Bellaire, those are even beginning to flood." Manchester, an east side neighborhood where nearly 90 percent of the population is Hispanic, set a record on Sunday with nearly 9 feet of water. Many of the residents there are now among the estimated 30,000 in need of shelters. Renters and low-income people in such neighborhoods couldn't afford the luxury of telling Exxon Mobil Corp. to keep its heavily polluting operations away from their homes and schools. That created what Texas Southern University sociologist Robert Bullard calls "sacrifice zones." "It's very predictable as to which areas are going to get hit the hardest, because of how money gets allocated in terms of flood protection and flood control," Bullard, often called the father of environmental justice, told HuffPost by phone on Sunday. "East side neighborhoods are the least protected." You're talking about a perfect storm of pollution, environmental racism, and health risks that are probably not going to be measured and assessed until decades later. Robert Bullard, the "father of environmental justice"
The petrochemical plants, oil refineries and shipping lanes that run adjacent to neighborhoods of color on Houston's east side spread toxic waste each time the city floods, adding to the woes of those communities, Bullard said. By Monday, residents across these industrial "fence-line" communities reported "unbearable" petrochemical smells in the air. "I've been smelling them all night and off and on this morning," Bryan Parras, an activist at the grassroots environmental justice group TEJAS who lives in Houston's East End, told The New Republic. Another resident, Stephanie Thomas, told Houston Press "something powerful" singed her nostrils, describing the smell "like burnt rubber with a hint of something metallic thrown in." Others on Twitter reported similar odors. @HoustonOEM It smells like a strong gas leak near the water pump on Lake Houston, near Summerwood. That day, a chemical leak forced officials in the Houston-area cities of La Porte and Shoreacres to issue a "shelter in place" order, urging residents to close windows and doors and turn off air conditioning and ventilation. Petrochemical plants are expected to release more than 1 million pounds of air pollution as a result of Harvey, according to the nonprofit Air Alliance Houston. "They not only have to deal with flooding in their homes, but pollution in water that's contaminated when water floods refineries and plants," Bullard said. "You're talking about a perfect storm of pollution, environmental racism, and health risks that are probably not going to be measured and assessed until decades later. The fact is that laissez-faire, unrestrained capitalism and lack of zoning means people with money can put protections up, and people without can't." The inequality in Houston's response to flooding is likely to worsen. It's difficult to pinpoint the role of climate change in creating a storm as destructive as Harvey, but violent, less predictable weather is expected to become more frequent as the planet warms. That bodes ill for Houston. Since 1960, flooding has killed more people and destroyed more property in the city than in any other in the country, according to data from Texas A&M. 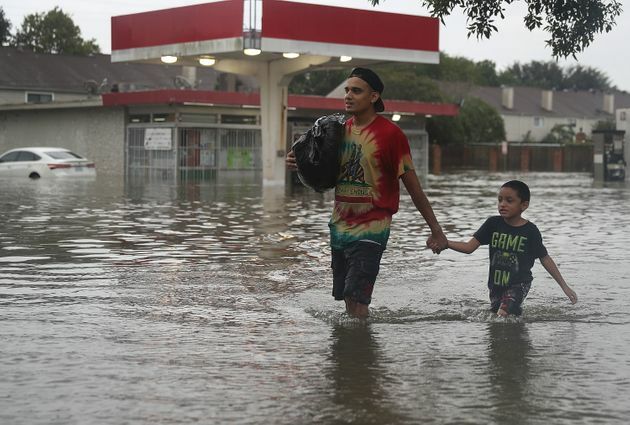 The Lone Star State ranks second, only to its Gulf neighbor Louisiana, in dollars paid in flood claims, according to the American Society of Civil Engineers. Yet Texas does not require local governments to enroll in the Federal Emergency Management Agency's National Flood Insurance Program. Bullard said blacks and Latinos tend to benefit less from recovery programs, such as FEMA grants, small-business loans and insurance payouts. "The people who are generally going to get left out are individuals on the margin, who may own a house, but may not have flood insurance or may not have a cushion or savings account to weather the storm until they get their insurance," Bullard said. Even as Harvey spread destruction from Houston's east side to areas such as Meyerland, the rebuilding process won't be as level. "The richer parts of the city are better able to handle these things because they have more resources," Andrew Dessler, a climatologist and professor of atmospheric sciences at Texas A&M University, told HuffPost by phone. "Adaptation takes money." Some of the city's wealthier neighborhoods, meanwhile, were dry and electrified Sunday night. Plushnick-Masti said she expects her neighborhood to recover more quickly than poorer areas to the east. "This is going to get fixed a lot faster than the lower income-neighborhoods," she said Monday afternoon. She noted that she was calling from a dry part of Meyerland, after charging her phone at a friend's place in Bellaire, an upper middle-class city within the city of Houston where electricity was on and only a few homes had flooded. Hart, the Texas State historian, said his parents' house, in the affluent Memorial area, has never flooded. It's protected by two dikes, manmade earthen dams and a giant spillway.